I may have posted about this before. I can't remember. 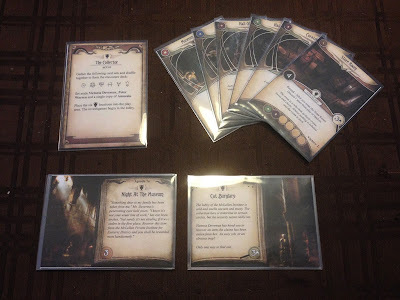 There is a guy on BoardGameGeek.com who made a couple of custom scenarios for Arkham Horror TCG. I printed out, cut and sleeved "The Collector", which, I think, is his first attempt. The custom scenario consists of the Act, Agenda and Location cards. 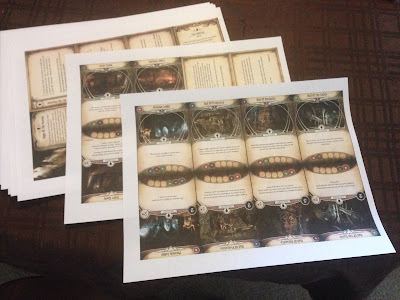 The Encounter deck is entirely drawn from the core box. In terms of playing the scenario, it felt a little directionless. Also, it was way too hard. I don't want to give away any spoilers, so I'll just say that at the cost of free, you should definitely check it out. I will say that I'm motivated to give custom scenario creation a shot and see how it works out. 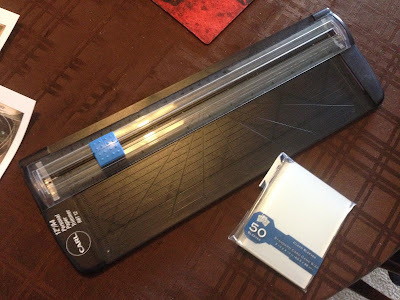 I have a couple of ideas to work on. Belisarius Cawl has SO MANY PARTS! Heralds of Ruin - Week 4, Fight! Wrath of Kings - Priming Happened! Heralds of Ruin - Week 4... Don't Fight? What next for the Iron Warriors? Heralds of Ruin - Week 3, FIGHT!